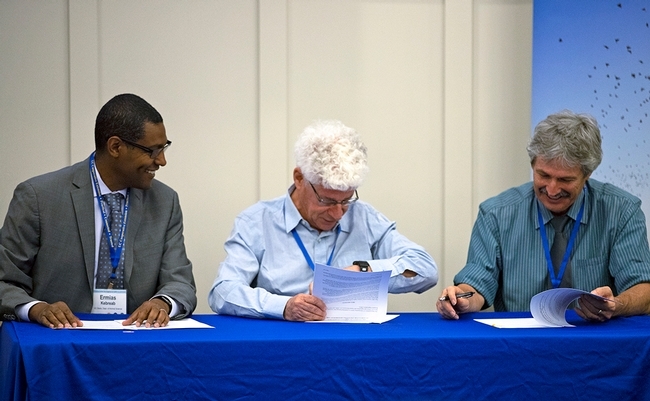 From left, Ermias Kebreab, Eli Feinerman and Mark Bell sign agreement for Israel and California scientists to collaborate more on water-related research and education. Pledging to work together to solve water scarcity issues, Israel's Agricultural Research Organization signed a memorandum of understanding with UC Division of Agriculture and Natural Resources and UC Davis on July 16. 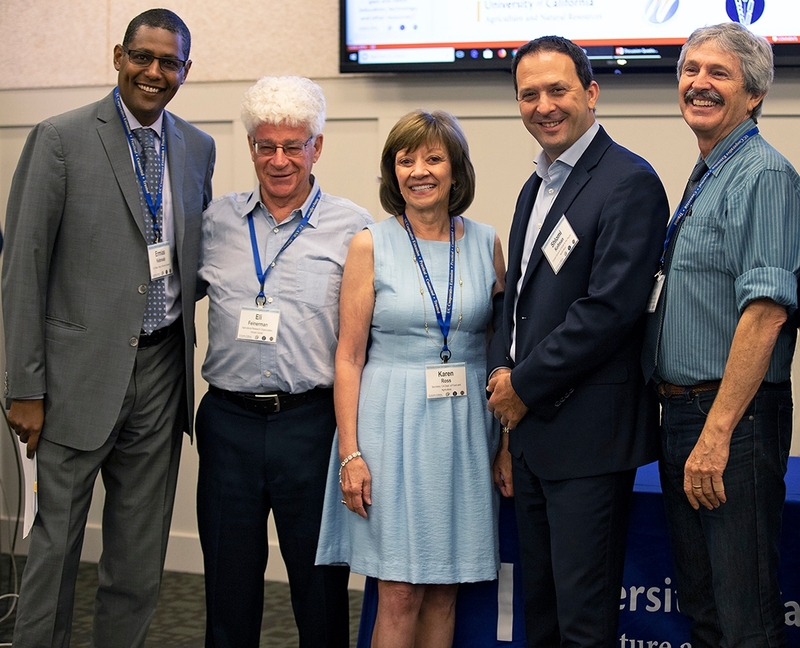 The signing ceremony kicked off the 2018 Future of Water for Irrigation in California and Israel Workshop at the UC ANR building in Davis. The agreement will enhance collaboration on research and extension for natural resources management in agriculture, with an emphasis on soil, irrigation and water resources, horticulture, food security and food safety. From left, Ermias Kebreab, Eli Feinerman, Karen Ross, Shlomi Kofman and Mark Bell. “We need the answers of best practices that come from academia," Ross said. Feinerman, Mark Bell, UC ANR vice provost, and Ermias Kebreab, UC Davis professor and associate vice provost of academic programs and global affairs, represented their respective institutions for the signing. Karen Ross, California Department of Food and Agriculture secretary, and Shlomi Kofman, Israel's consul general to the Pacific Northwest, joined in celebrating the partnership. Ross touted the progress stemming from CDFA's Healthy Soils Program to promote healthy soils on California's farmlands and ranchlands and SWEEP, the State Water Efficiency and Enhancement Program, which has provided California farmers $62.7 million in grants for irrigation systems that reduce greenhouse gases and save water on agricultural operations. “We need the answers of best practices that come from academia, through demonstration projects so that our farmers know what will really work,” Ross said. 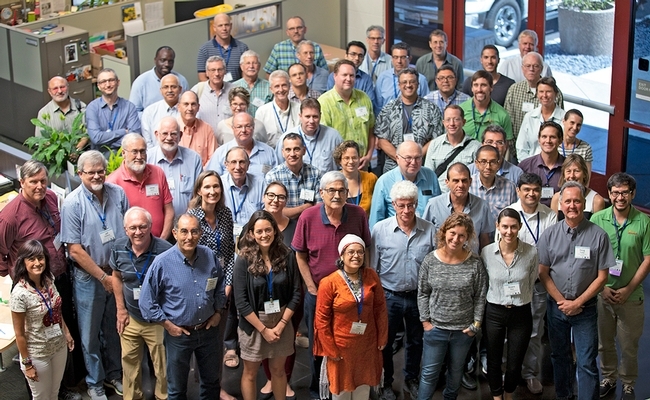 Scientists from Israel and California met to exchange ideas for managing water for agriculture.